Paper presented at the conference An Environmental History of Neoliberalism, Lund University, 6-8 May 2010. We are in a spiral of environmental decline. Since 1945 17% of the planet’s vegetated surface has been irreversibly degraded. The Tierra Project is just one small part of a global network of Eco-Parks that Greene Planet has created to rejuvenate the world on the brink of collapse. I hope that tonight you make a decision to be part of that. Meanwhile, Greene is creating immense environmental and social upheaval: investing in oil pipelines and profits in various localities globally; creating a scarce resource of Bolivian water by diverting it into huge hidden dams, thereby increasing dependence on private provision which he of course owns; and managing a tight cabal of self-serving global élites intent on resource capture on a massive scale. The parallels with contemporary scenarios are uncomfortable. As Mac Chapin in A Challenge to Conservationists, Christine Macdonald in Green Incorporated and Dan Brockington in Celebrity and the Environment have detailed recently, the world’s major environmental organisations are collaborating systematically with corporations known more for their socially and environmentally polluting effects, competitive exploitation of highly valued natural ‘resources’, and élite profit structures. Donations from the corporate world have led to staggering increases in such funding for the ‘not-for-profit’ mega-environmental NGOs (ENGOs) of Conservation International (CI), The Nature Conservancy (TNC), the World Wide Fund for Nature (WWF), the Wildlife Conservation Society (WCS) and the African Wildlife Foundation (AWF); leading to harsh accusations that these organisations are ‘polluter-funded leeches sucking on the flesh of en vironmentalism, leaving it weaker and depleted’. The corporate world in turn is rewarded by these mega-ENGOs with ‘green awards’ for apparent demonstrations of environmental stewardship, distributed at glamorous environmental fund-raisers not dissimilar to that conveyed for Domenic Greene’s ‘Eco-Parks Foundation’ in Quantum of Solace. Corporate ‘green’ reputations are thereby ensured, contributing to accusations of ‘greenwash’ from some quarters. But the benefits to business do not stop there. Environmental mega-NGOs increasingly are working with the corporate, business and financial worlds to reformulate and repackage environmental conservation and ‘sustainability’, such that this is centralised as part of profit-making portfolios. This includes: endorsement of so-called ‘green’ products; assistance with finding ‘offset’ solutions, such that environmentally damaging extractive development in one location can be ‘offset’ against investment in environmental health in a different location; work to mobilise additional financial values in land now owned by corporations based on measures of environmental health, such that these can be traded in new environmental offsetting markets and additional profits can ensue; and lobbying international environmental policy forums for subnational rather than national targets, the former being easier to manage for lucrative revenue generation under emerging global markets in new environmental commodities. There are several interrelated strands to the justifying, and neoliberal, logic guiding these alliances and practices. First, that it is a capitalist market economy based on the profitable trade of commodities, including commoditised environmental damage, that will solve environmental crisis. Second, that it is only the correct pricing and ‘capitalization’ of nature, framed as the attribution of ‘value’, that stands between degradation and health of the non-human world. Third, that with the assistance of appropriate technical, scientific, economics, financial and legislative expertise, this pricing will additionally boost and sustain the global economic growth required to sustain capitalism, thus producing ‘green growth’. And fourth, that business and corporations are the key to the development and instituting of social and environmental ‘sustainability’. Stuart Hart, writing in the Harvard Business Review epitomises this view in the statement that ‘corporations are the only organizations with the resources, the technology, the global reach, and, ultimately, the motivation to achieve sustainability’. In this logic, it clearly makes sense for those with apparent expertise in nature management to join forces with those with expertise in business and finance. Since a key motivation in the corporate, business and finance worlds is the expansionary production of surplus to sustain the acquisition and growth of capital, what is required for these sectors to be brought onto the environmental board in a structural way is that environmental concerns are reconfigured as ‘a major source of revenue growth’. ‘Sustainable development’, as the catch-term that brings the notion of environmental sustainability into the arena of economic development, increasingly is presented as ‘one of the biggest opportunities in the history of commerce’, with companies ‘selling solutions to the world’s environmental problems’. This is a discourse that has intensified in the wake of recent financial crisis. These developments constitute an important shift. Under neoliberalism, business frequently has been protected from the costs of environmental governance through ‘free trade’ agreements that identify environmental regulation as a barrier to trade, and that may require additional legal mechanisms to protect the right to profit of investors. Today, the current combination of environmental and financial meltdowns instead are being constructed explicitly as creating investment opportunities in ‘sustainability’. 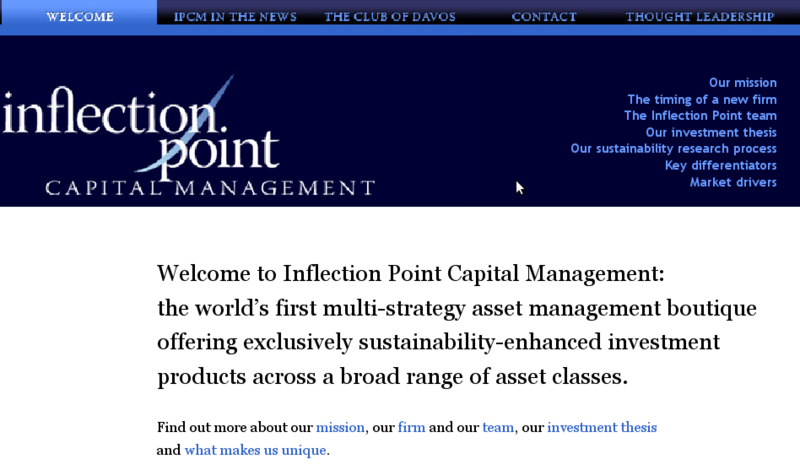 The homepage of the new investment fund ‘Inflection Point Capital Management’, for example, states that it is ‘the world’s first multi-strategy asset management boutique offering exclusively sustainability-enhanced investment products across a broad range of asset classes’; and elsewhere on the website includes the statement that the company sees ‘recent market meltdown as a multi-trillion dollar “advertorial” for sustainability-enhanced approaches’. This fund is headed by Matthew Kiernan, acclaimed author of Investing in a Sustainable World, former President of the World Business Council of Sustainable Development (WBCSD), and regular speaker at the annual Davos World Economic Forum. Kiernan suggests that we are entering a ‘Sustainable Investment Revolution’, poised to re-engineer ‘the very “DNA” of the capital markets’. The cover of Kiernan’s book features an image of a blue-green earth, half of which is subsumed by gleaming American quarter-dollar coins (1.). This is an optimistic ‘earth-as-money’ trope repeated in the logo of the United Nation’s Environment Programme’s (UNEP) New Green Deal initiative, which depicts a delicate young green plant, shooting up from a pile of Euro coins (2. ); and echoes an earlier UNEP and IUCN (International Union for the Conservation of Nature) document on payments for ecosystem services (PES) that includes an image of verdant green foliage amongst which various currency notes appear as ‘leaves’ (3). This apparent ‘financialisation’ of environmental crisis and protection extends a key feature of capitalism in its current guise as neoliberalism. As Moore notes, this is ‘the penetration of finance into everyday life, and above all into the reproduction of extra-human nature’. In this paper I am concerned with the specific ways in which this financialisation is occurring in the arena of environmental governance for environmental conservation, as a constitutive part of ‘world-ecology’ – of both ‘the accumulation of capital and the production of nature’ – under neoliberal capitalism. I am interested in environmental crisis as not only signalling a developmental crisis of capitalism – aka James O’Connor’s ‘second contradiction of capitalism’, whereby capitalism undermines its own possibilities for accumulation by depleting its required material base. Instead, I wish to draw attention to the ways in which environmental crisis and conservation become accumulation opportunities for capitalism, particularly through relationships with finance and investment. 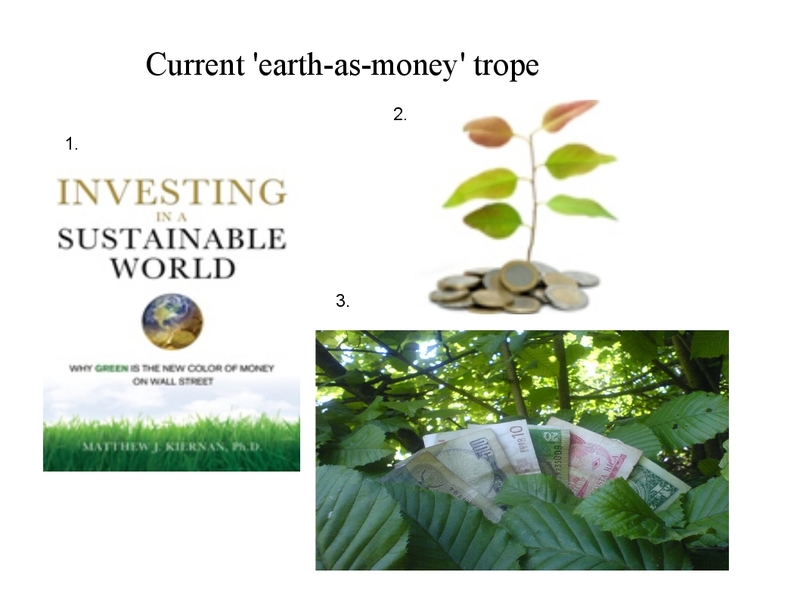 I thus depart from Brockington and Duffy, who state that ‘[c]onservation has hardly been involved in the production of value through financialisation’, in focusing on some ways in which environmental governance for conservation, justified by environmental crisis, currently is being financialised. For capitalism to make an accumulation opportunity of environmental crisis it needs to create new products, new commodities, that can be invested in, traded and speculated on. Nature needs to be ‘capitalised’ and ‘capital ecologized’ in new ways. Or, to paraphrase Morgan Robertson, capital needs to create new natures that it can see: requiring that the earth-in- crisis is rethought and reworded such that it is brought further into alignment, conceptually, semiotically, and materially, with capital. With regard to the scale of planetary ecosystem management, three statements by significant ‘players’ in the world of global environmental governance are indicative of the magnitude and reach of this current ideational shift. The first is by the Deputy Head of the Species Programme of the IUCN who, in a 2009 document on the IUCN websites states that ‘[i]t’s time to recognize that nature is the largest company on Earth working for the benefit of 100 percent of humankind – and it’s doing it for free.’ The second is by Maurice Strong, Secretary General at the 1972 UN Conference on the Human Environment in Stockholm and the 1992 Earth Summit in Rio, and first Executive Director of the UNEP. In a 1996 lecture to the Korea Institute for International Economic Policy, Seoul, he states that ‘[i]n addressing the challenge of achieving global sustainability, we must apply the basic principles of business. 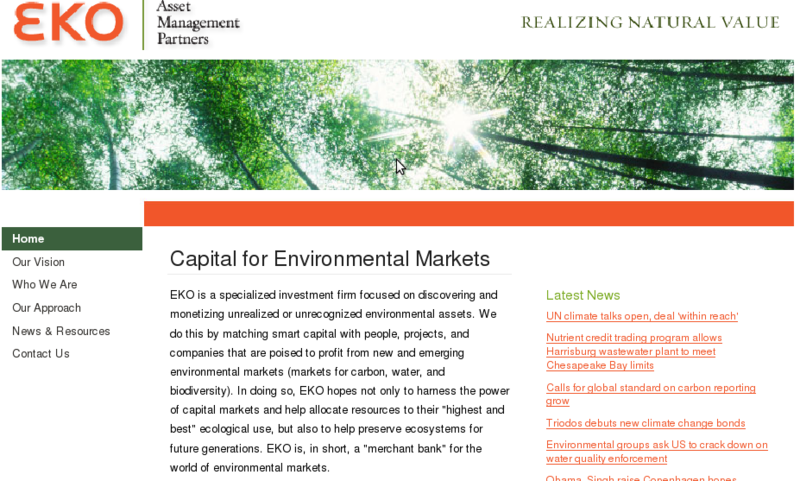 This means running “Earth Incorporated” with a depreciation, amortization and maintenance account.’ Recently, this second statement has appeared in full on the website of a new investment fund called EKO Asset Management Partners, whose website homepage describes them as ‘… a specialized investment firm focused on discovering and monetizing unrealized or unrecognized environmental assets… in short, a “merchant bank” for the world of environmental markets.’ EKO’s investors hail from the world of haute finance and include James Wolfensohn, 9th president of the World Bank Group, as well as Lord Jacob Rothschild and Alexander and Ben Goldsmith of the Rothschild and Goldsmiths banking dynasties. There are two key aspects of these statements that I wish to emphasise. First is the conceptualisation of nature as a company that needs to be acknowledged for the work that it does. Of course, any ensuing payments do not actually go to nature, but to the people who are able to capture them. So what becomes significant is the question of who, via enforceable property rights signalling ownership, becomes able to capture the revenue arising from such exchanges. The second is the construction of nature as akin to a bank account: as a store of capital, requiring and justifying ‘its’ expert management by ‘nature bankers’. These conceptualisations are making possible the rapid creation and proliferation of an arguably unintuitive, even weird to use Polanyi’s term, ‘environmental infrastructure’ of new markets in novel environmental commodities seen as representative of environment health and damage. In combination, these innovations are posited as a solution to environmental crisis that not only sustains a capitalist political economy but actually enhances it to produce ‘green growth’ (see below). This environmental infrastructure is populated by a new and frequently opaque ecology of intersecting terms and concepts: offsetting, payments for ecosystem services, natural capital, green-indexing, biodiversity derivatives, green bonds, environmental mortgages, to name a few. In what follows I highlight a few aspects of these new concepts and products that I think are indicative in terms of the earth they are bringing forth, and in which particular social relationships, as well as relationships between human and non-human worlds, are implicit and imbricated. 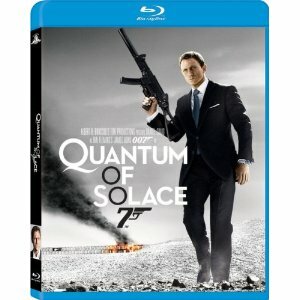 I will conclude with some gestures towards how I am currently theorising the implications of these phenomena. See discussion of this paper on the Capital Institute website here.